Can a Wounded Mourinho Revive Manchester United? 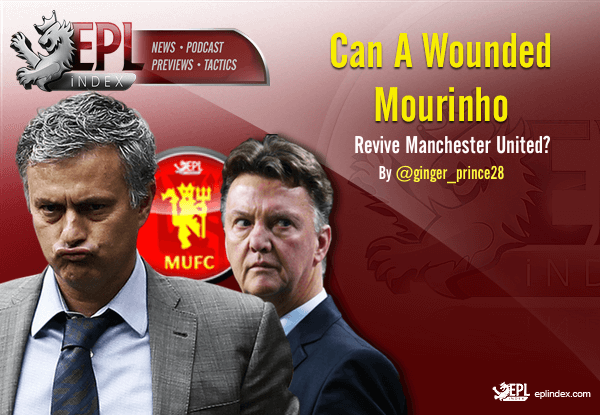 EPL Index > EPL Index Featured Article > Can a Wounded Mourinho Revive Manchester United? Besides the glaring failure to qualify for the Champions League despite spending huge amounts of money, the biggest shortcoming of Manchester United under Louis Van Gaal has been how far the Red Devils have distanced themselves from what they adhered to for decades upon decades. United, under Louis van Gaal, have gone from getting the foundations right to an incapability to progress forward, to hitting the ultimate brick wall in terms of squad improvement. United have stagnated and for good or worse, changes are needed on so many levels to arrest the rot, which could leave them in their wake ahead of the new season with the rest of England all seeming to pull away any moment, at their expense. A lot has been said, and rightly so, about United’s lack of goals (10th highest scorers in the league) – lack of chance creation (18th in the league) in games despite the amount of possession (4th) they end up having in every game. The restrained, lifeless style of play that United supporters have had to endure for the past two years under Louis van Gaal was so frustrating for the fans that some of those that managed to get a ticket for the final at Wembley literally booed when Van Gaal climbed up the famous stairs to collect United’s 12th FA Cup and their first major trophy post Sir Alex Ferguson. The news about Mourinho’s future at United didn’t take long to come out as several media outlets including the likes of Spanish paper AS claiming that the Portuguese manager is confirmed to take over the reins at Old Trafford despite the FA Cup win and the decision was made right after the defeat at Boleyn Ground which ruled them out from making it to the Champions League next season. The manner in which the news broke before the club communicated the information to the Dutchman does not represent the club how it should, although this shouldn’t come as a surprise as any football club is only as good as its owners and the people responsible at the top end at Man United have long been doing things in a rather classless way. It’s no secret that this was the job that Mourinho had always wanted. His admiration towards Sir Alex Ferguson and the behemoth that Manchester United are, in the football world, it should not raise eyebrows that a highly self-centred individualist like Jose Mourinho would want to test himself on a platform like Manchester United in what is the most competitive and scarily unpredictable league in the world. The sacking at Chelsea, months after leading them to a fourth Premier League title in twelve years was rather unexpected in a season that was filled with shocks of such magnitude, but this only means that he will want to prove to his old employers and doubters that he could be successful again, which can only good as far as United are concerned. Add to it the fact that his arch nemesis Pep Guardiola joining the blue half of Manchester in a bid to complete the power shift that has been happening for a while now, this only makes the league and the derby in Manchester in particular, even more feisty than it already has been, in recent years. Could this lead to a new era of Manchester’s dominance in the Premier League? With the sudden ascent of Leicester City, Pochettino’s Tottenham Hotspur and the traditional challengers in Arsenal, Liverpool and a Conte-inspired revolution at Chelsea, an idea of two teams from the same city taking centre stage in the league looks a bit far-fetched despite the fact that these two will be overseen by the most sought after managers in the game right now, with a glittering CV to support this reputation. Louis van Gaal, despite all the internal power struggles and catastrophic mismanagement of resources and talent, managed to deliver a trophy, a much needed injection of silverware at a time when the identity of the club was in jeopardy as much as a sense of direction. But it is up to Mourinho now to take over the mantle and invest his time and invaluable experience to take Manchester United to the heights they used to reach, until not long ago. If there’s anyone that could do it, it’s him. Categories: EPL Index Featured Article, EPL Team Analysis, Manchester United, and Manchester Utd (NN).' 'Tags: "Manchester United", Arsenal, Arsenal Stats, Chelsea, EPL, Liverpool, Louis Van Gaal. Sir Alex Ferguson, Manchester City, Mourinho, MUFC, premier league, and Van Gaal. Louis Van Gaal - Is His Time Up?